I have posted here several critiques of the film, “Waiting for Superman,” so I do not need to repeat these criticisms. The most fact based criticism is What Superman Got Wrong. My goal in the following is to share my own reaction to the film. First, it is an important film and I encourage people to see it. It illustrates to a rather uninformed public several of the important issues including the budget crisis in schools and the importance of having quality teachers. Second. The film makes two glaring claims that were assertions by anti union advocates when the film was made and now are wrong. 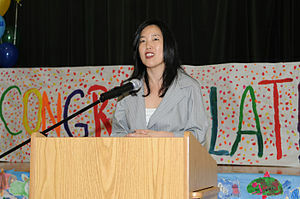 The film claims that the teachers union leadership in Washington D.C. would not allow the Michele Rhee offered contract to come to a vote. In fact, since the film was made, the contract was submitted to a vote and it passed. That is Rhee got the contract she wanted- which the film claims was made impossible by union obstruction. Also, the film supports its claim that incompetent teachers are difficult to remove by citing the extreme case of the New York City room, called by the press the “rubber room.” It is a compelling story. However, the so called “rubber room was eliminated last year by the very union contract which the film makers claim was protecting incompetent teachers. Yes, the film has several anti union charges by various selected speakers. For example there is the assertion by a New York Times writer that the two teachers’ unions dominate the Democratic Party. This is a common claim among Republicans and a few Democrats. And, yes, the film claims that the teachers’ unions gave significant funds to elect Obama. However, it is not true that the teachers’ unions were the largest contributors to the Obama campaign. The records clearly show that Finance Capital was the major large donors to the Obama campaign. In addition, under Secretary Arne Duncan federal policy has continued and perhaps even accelerated in its anti union course. The federal policy known as Race to the Top used competition between the states and a $ 4.1 billion dollar allocation to get more than 34 states to change their laws and to encourage more charter schools- a policy supported by the film makers and generally opposed by the teachers’ unions. The film promotes a particular direction as reform. The narrator several times says, “reform experts agree “ when in fact they do not agree. The narration recognizes only the Michelle Rhee, Joel Klien, direction of reform and does not recognize the literally hundreds, perhaps thousands, of persons who have been working in the trenches for substantive reform for decades. Randy Weingarten, President of the AFT and seen in edited and clipped statements in the film described this group in August this way, “Never before have I seen so few attack so many, so harshly, for doing so much—often with so little. I don’t know if I should call the people attacking us, quote, “reformers,” as they like to be known—or performers, which might be more accurate. Because many of them seem more interested in engaging in political theater than constructive conversation. So I’ll just call them the “blame-the-teacher crowd,” and even though many of them have set their sights on all public institutions, I will focus on the institution that has gotten the most abuse—public education. The blame-the-teacher crowd would have Americans believe that there is only one choice when it comes to public education: either you’re for students, or you’re for teachers. That is a bogus choice. The film maker distorts the needed discussion of school reform by citing only one side of the debate- that of the Billionaire Boy’s Club and their well funded spokespersons. The film decries the teachers unions as a special interest while reporting on Bill Gates, the Olin Foundation, the Bradley foundation, the Broad Foundation, and the entire raft of very conservative economic interests. Their declared interest is the shrink the public sector – as in public schools- and to spend less money on tax supported institutions. A second goal of several of these foundations is to defeat the power of teachers unions and the Democratic Party. There is a problem with the great majority of real school reformers spending their time combating the charters/boy’s club groups. Battling the media frenzy takes time that could be spent improving schools.However, the battle must be engaged. The charters/ boy’s club group, including the Democrats for Educational Reform, Bill Gates, etc., have successfully captured the Obama administration policy apparatus under the leadership of Arne Duncan. Their policies, known as Race to the Top, are the funded, active policies. On several occasions the narrator of Waiting for Superman is loose with the data, making claims that should require several qualifiers to be adequate. Some of the anti union shots are wrong, some are out-of-date, and some are simply statements of opinion by various observers- not people who work in schools. Most of us do not regard the test based accountability as required in No Child Left Behind and many state laws as sufficient nor adequate. It is often not even helpful in producing school improvement. The film also under reports the interventions of the Harlem Children’s Zone. Not only are the schools intensified, the children get health care, food, parental counseling, and a wide variety of supportive services in the Zone. That is great. It is the way to intervene. But, other schools do not have these funds and services. For more on this approach see: http://www.boldapproach.org/. So, the producers and the television talking heads claim that they want to discuss the film. Fine. Lets discuss it. But, lets let all sides in on the discussion and not frame the discussion as the film does as reformers v the teachers’ union. That is a limited view of the many issues. More to follow. This post was published as Facts Are Superman’s Kriptonite. in the Winter Issue of Democratic Left, the journal of DSA. Colleagues of mine who have seen the film have characterized it as a “disgusting fraud” rather than an important film, but kudos to Duane for taking the time to lay out his concerns. Since this “documentary” has received acclaim from other Hollywood types and will probably be nominated for an Academy Award, it is an important cultural touchstone in the sense that some so-called “liberals” have come to think that attacking teachers’ unions is now okay. How such attacks will serve the attackers’ stated goal of helping children succeed remains a mystery. In today’s climate of shrinking state and local budgets, of attacks on all public employees’ pensions and salaries, attacks on public school teachers and their unions serves only one agenda–that of the charterizers and privatizers. At bottom it is a union-busting agenda, and must be opposed. It will most likely help a lucky few children while leaving the vast majority even further behind. I realize that as a 27-year English teacher and union activist in LA Unified School District, I am just a “special interest.” Certainly teachers’ unions could have been more positive in our efforts around teacher evaluation and accountability over the years. We were late to the table, for sure. Some teachers should not be teaching, and as professionals we should have stood up better for our profession. But we are not the enemy of our students, and if our society is serious about meeting the educational needs of all our children, we must stop looking for “magic bullets,” stop “waiting for superman,” and start empowering teachers, parents, and students at the local level with the resources we need. Read the mission statement of Studentsfirst.org. Then decide what you think. Its goals and priorities are all laid out now (after a massive survey of parents and educators). I am trying to read these, but the web page will not open. You have 1 million hits. But, if this is the same Studentsfirst declared in Sacramento today and led by Michele Rhee, then there is reason to be concerned. I will read the goals and priorities as you suggest. I recommend that you read today’s post on ChoosingDemocracy.blogspot.com on Michele Rhee’s new project, and the response. There are several posts about Rhee there. Also, I recommend Diane Ravitch, The Death and Life of the Great American School System, particularly the chapter on the billionaires boys club. And, I recommend Chapter 13 in my book, Choosing Democracy: a practical guide to multicultural education, (4th. edition) 2010. The chapter is on democracy and school reform. But, I will read the goals and priorities when the web opens up.